F is for friends - once they sinned, Adam and Eve could no longer be friends with God. .... and so it goes through the message of man's fall and God's way of salvation through faith in Jesus Christ. 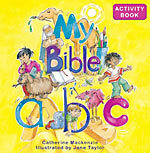 This Bible activity book is full of drawings to colour, seek-and-find items, activity ideas and exciting information about God's Son and how he loves us. An excellent introduction to the gospel for young readers. Very simple but yet covering many Bible truths. Includes Bible references. Can be used as a help for Sunday School or Scripture teachers.